Need a heavy duty tow truck? Heavy Duty Towing Service. When you need heavy duty towing anywhere in Illinois or Northwest Indiana Classic Towing is the company to call. We offer towing service for semi-trucks, box-trucks, buses, RVs, tractor-trailers, and most large commercial vehicles. We have been providing heavy duty towing in Bolingbrook, Joliet, Elwood, Lemont, Naperville, and Aurora for over 25 years. Our fleet of heavy duty wreckers and certified tow operators are trained and equipped to perform in even the most challenging of situations. Whether you require heavy duty towing or roadside assistance such as: diesel delivery, a jump start, pull start, winch-out, load shift, or accident recovery, Classic Towing is here to assist 24-hours-a-day, 7-days-a-week. When you contract heavy duty towing service through Classic Towing you can expect to receive an honest and competitive rate, unparalleled service, and the equipment and expertise to complete any heavy duty towing or recovery job. With several dispatch centers located throughout the Chicagoland area we offer fast response on most local highways and interstates. Here at Classic Towing, we understand that time is money and the longer your vehicle is down the greater the risk is to your bottom line. Due to this understanding, we strive to operate with an urgency to get your vehicle to the repair facility or back on the road as quickly and safely as possible without causing further damage. If you have another truck you would like to us to tow out to your disabled unit to continue the load, let us know. We can perform a tractor swap by taking a second power unit to your stranded driver and tow the downed bobtail back in for repairs. We even provide long haul over the road towing service if your truck is stuck in another state and you need to get back to the Chicagoland area. You can always count on Classic Towing’s fleet of heavy duty wreckers, semi-trucks, and Landoll trailers to help you get back up and rolling. In addition to our heavy-duty towing service, Classic Towing also provides transport and logistical support. If you have a load that needs to be transported but are short on trucks or drivers for the day we can help. We will send out one of our tractors to move your trailer where it needs to go. Have a hot load and in a pinch? Need an emergency CDL driver for the day? Driver out of hours? No problem. 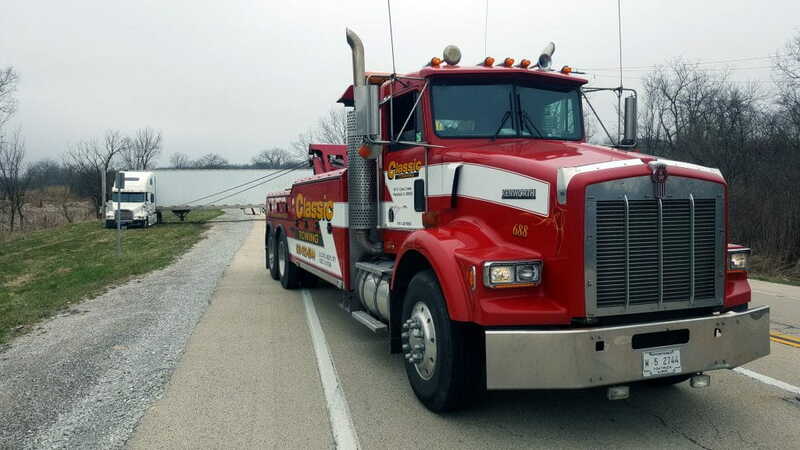 Hire Classic Towing to send out a CDL driver to get the route done and avoid costly hours of service (HOS) violations. Do you need heavy duty towing in Naperville, IL? What heavy duty towing service in Aurora, Joliet, Plainfield, Lemont, Elwood, Bolingbrook, or anywhere else in the Chicagoland area? Look no further and make Classic Towing your first choice for jump starts in Naperville and all throughout Chicagoland. Getting fast, dependable heavy duty wrecker service means choosing the right heavy duty towing provider. Classic Towing is the right company with its professional, expert service and a reputable 25 year proven track record serving Naperville and the Chicagoland suburbs. We provide fast, affordable heavy duty towing service in Naperville, Aurora, Joliet, Lemont, Bolingbrook, and anywhere else within Illinois or Northwest Indiana. We can have a heavy duty wrecker anywhere, in the Chicago Metropolitan area, in about 30 minutes or less. We have the equipment, expertise, and staff to handle any towing need, light, medium, or heavy duty, 24 hours-a-day, 7 days-a-week. Call today for heavy duty towing service in Naperville, IL! Classic Towing… we are always just around the corner. Classic Towing provides heavy duty towing and recovery services on all major highways and interstates including: I-88, I-355, I-55, I-294, I-90, I-94, I-80, I-39, I-57, and I-65. We will respond pretty much anywhere in Illinois or Indiana with heavy duty towing service including, but not limited to: Addison, Algonquin, Alsip, Amf Ohare, Arlington Heights, Aurora, Barrington, Bartlett, Batavia, Bedford Park, Beecher, Bellwood, Bensenville, Berkeley, Berwyn, Big Rock, Bloomingdale, Bloomington, Blue Island, Bolingbrook, Braceville, Braidwood, Bridgeview, Bristol, Broadview, Brookfield, Buffalo Grove, Burbank, Burlington, Calumet City, Carol Stream, Carpentersville, Cary, Channahon, Chicago Heights, Chicago Ridge, Chicago, Cicero, Clarendon Hills, Coal City, Cortland, Country Club Hills, Countryside, Crest Hill, Crete, Crystal Lake, Darien, Deerfield, DeKalb, Des Plaines, Dixon, Dolton, Downers Grove, Downers Grove, Dwight, Dyer, East Chicago, Elburn, Elgin, Elk Grove Village, Elmhurst, Elmwood Park, Elwood, Eola, Essex, Evanston, Evergreen Park, Flossmoor, Forest Park, Fort Sheridan, Fox River Grove, Fox Valley, Frankfort, Franklin Park, Franklin Park, Gardner, Gary, Geneva, Genoa, Gilberts, Glen Ellyn, Glencoe, Glendale Heights, Glenview, Glenwood, Golf, Griffith, Hammond, Hampshire, Hanover Park, Harvey, Harwood Heights, Hazel Crest, Hickory Hills, Highland, Highland Park, Highwood, Hillside, Hinckley, Hines, Hinsdale, Hoffman Estates, Hometown, Homewood, Huntley, Island Lake, Itasca, Joliet, Justice, Kaneville, Kankakee, Kenilworth, La Grange, La Grange Park, Lafox, Lake Forest, Lake In The Hills, Lake Zurich, Lansing, LaSalle, Leland, Lemont, Libertyville, Lincolnshire, Lincolnwood, Lisle, Lockport, Lombard, Long Grove, Lyons, Malta, Manhattan, Manteno, Maple Park, Markham, Matteson, Maywood, Mazon, Medinah, Melrose Park, Merrillville, Midlothian, Millbrook, Millington, Minooka, Mokena, Monee, Montgomery, Mooseheart, Morris, Morton Grove, Mount Prospect, Mundelein, Munster, Naperville, New Lenox, Newark, Niles, North Aurora, Northbrook, Northlake, Oak Brook, Oak Forest, Oak Lawn, Oak Park, Olympia Fields, Orland Park, Oswego, Ottawa, Palatine, Palos Heights, Palos Hills, Palos Park, Park Forest, Park Ridge, Peotone, Peru, Plainfield, Plano, Plato Center, Portage, Posen, Prospect Heights, Richton Park, River Forest, River Grove, Riverdale, Riverside, Robbins, Rockford, Rolling Meadows, Romeoville, Roselle, Saint Charles, Saint John, Sandwich, Schaumburg, Schererville, Schererville, Schiller Park, Seneca, Serena, Shabbona, Sheridan, Shorewood, Skokie, Somonauk, South Elgin, South Holland, South Wilmington, Steger, Stone Park, Streamwood, Sugar Grove, Summit Argo, Sycamore, Thornton, Tinley Park, Valparaiso, Vernon Hills, Villa Park, Virgil, Warrenville, Wasco, Waterman, Wauconda, Waukegan, Wayne, Wedron, West Chicago, Westchester, Western Springs, Westmont, Wheaton, Wheeling, Whiting, Willow Springs, Willowbrook, Wilmette, Wilmington, Winfield, Winnetka, Wood Dale, Woodridge, Worth, Yorkville.